In 1913, the Ligget and Myers Tobacco Company of New York issued a sweet set of baseball cards. 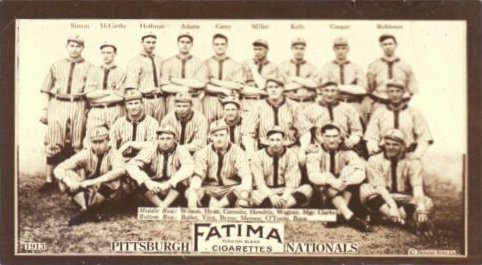 Catalogued as 1913 T200 Fatima Team Cards, the set consists of 16 team cards, one for each of the 8 NL and 8 AL teams in 1913. According to Chuck Paris' excellent T200 page, the set depicts a total of 369 players, managers and mascots. That's a huge number of players for only 16 cards. Probably wouldn't be cheap, but putting together this set would almost give you the whole league! At 2 5/8" x 4 3/4, I can't help but wonder if some of the details of the team photos are tough to make out, but I've never so much as seen one in person. Still, I wonder how cool this set would look displayed all together. If you have the money and the patience, there's also a premium version of this set, which is the same images but in a much larger premium format. When I first started to compile an extensive list of George Gibson cards many years ago, I just assumed the T200 would be on the list. I looked forward to being able to add the Pittsburgh Club card to my collection. Noticeably absent from the team picture, after batting .240 and leading all NL catchers with a .990 fielding percentage in 1912, none other than George 'Moon' Gibson. Yep, you read that right. No Gibson. This was a disappointing discovery. It still is. Gibby was on the Pirates in 1913, but he only caught 48 games. Mike Simon (yep, that Mike Simon), played in 92 games. For a long time I wondered why Gibson would be missing. Eventually I learned that Gibson broke his ankle early in 1913 and missed a couple of months of the season. Since I don't know when this photo was taken, I can't say for sure that the broken ankle is the reason Gibson is missing, but it's a simple enough explanation to bring closure to this for me. And besides, whether I have the sure answer or not, Gibson will remain noticeably absent from the team picture, and that card will remain noticeably absent from my collection.